Nerf has been providing armaments for kids since 1980 and their weapons have been proven to be of exceptionally killer foam quality. 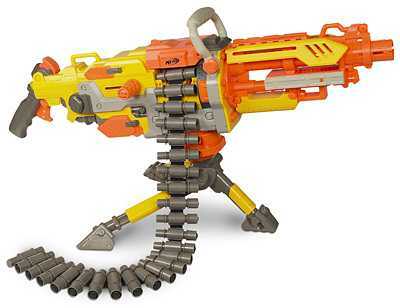 From dart guns to Nerf reactor guns, every one of it had unique color combinations and exceptionally attractive designs. As these army weapons play a huge role in the creation of the foam weapons, I guess their latest gun has been dedicated to a semi machine gun. This is “Nerf Vulcan Automatic Heavy Blaster” which is here to give you the experience of what using a machine gun feels like. It gives the feeling like a hero of an action movie with his Nerf Automatic sidearm running into the enemy base and after shoot them down back to his base. It’s really heavier and your shoulder should be strong enough to carry it as its about 8 pounds weight with a dimension of 30” x 6.5” x 12” which is integrated with target sight and removable carrying handle. Even it has ammo belt box along with which contained with 25 screaming mini darts, which are enough to frighten your enemies when they will face it. You can spray the bullets, I mean to say the darts, in every 3 seconds and just amazing that your enemies will see you with envy and must surrender, when they will see you to spraying out these darts with your automatic Vulcan and the empty belt popping out from the one side of the heavy automatic blaster, its really gives you the heroic feelings. This automatic blaster with instruction available with a price tag of $49.99 along with belt fed ammo delivery system included of 25 screaming mini darts and belt box. One thing I forgot to mention that you will be provided one foldable and removable tripod as stand of this gun and spray the bullets, which sometimes to save you to carry the heavy weight. You can get one shoulder strap & 6 D batteries to power it with an extra cost. You can get a video demo here for your further knowledge. Even I like you to see some more such interesting toy gadgets like Starfleet TX 540 Tricorder and Robotic Hammerhead Shark , which might attract you too.